When you’re choosing a retirement community, it’s all about location. Kendal at Longwood and Crosslands share a 500 acre campus in Southern Chester County, Pennsylvania, in the heart of the Brandywine Valley. Not only are we located in one of the most picturesque places in the Country, inspiring artists like the Wyeth Family for generations, but we also have easy access to Philadelphia, Wilmington, New York, Baltimore and Washington, D.C., and all they have to offer. That makes Kendal-Crosslands Communities perfect whether you enjoy quiet country living, gardens and outdoor activities, or want to go to concerts, the theater or museums- all are close by and waiting for you! The Brandywine Valley runs alongside the Brandywine River, reaching from Southern Pennsylvania into Delaware. The area is sometimes referred to as Chateau Country, for the large homes, many built by the du Pont family, in and around Wilmington, Delaware. The area is full of scenic drives and attractions, and was featured in National Geographic’s road trip series. Southern Chester County is known for both its beauty and its location in the center of the New York to Washington, D.C. corridor. 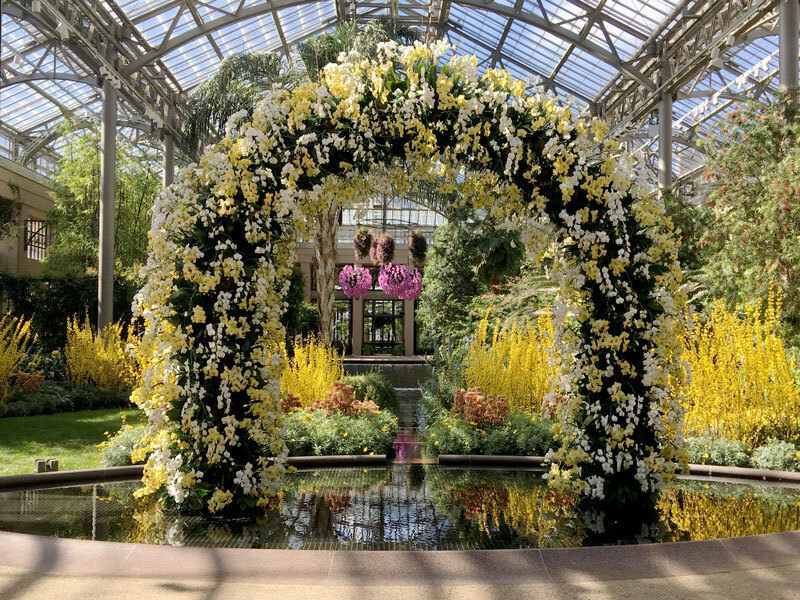 Whether you want to walk through the famous Longwood Gardens, paddle a canoe down the Brandywine River into Delaware, or want the excitement from the arts, entertainment and shopping in nearby Philadelphia or Wilmington, all of this is available within 25 miles of Kendal-Crosslands Communities joint campus. Kennett Square Kendal-Crosslands Communities sits just 3 miles from historic downtown Kennett Square, PA, known as the Mushroom Capital of the World. Chester County, and specifically the area surrounding Kennett Square, produces the majority of the mushroom crop in the US, bringing with it a $2.5 billion dollar impact to the local economy. This is celebrated with the annual Mushroom Festival held each year in early September, and with the “Mushroom Drop” on New Year’s Eve where a lighted mushroom drops in the center of town to ring in the New Year. Kennett Square also hosts a number of craft beer festivals, Friday Farmer’s Markets, and Third Thursday Arts in the summer that make Historic Kennett Square a wonderful nearby destination our residents love. The local mushroom industry relies on many of the natural resources of the local agricultural area, so you will find rolling farmland and also a thriving thoroughbred horse breeding industry nearby. As you can imagine, this symbiotic relationship between the agricultural industry and the local economy makes preservation of natural resources and open space important. There are two main local land conservancy organizations, The Land Conservancy for Southern Chester County and the Brandywine Conservancy which help lead conservation efforts and maintain local preserves, trails and parks. The Brandywine Creek Greenway is a regional planning effort of the Brandywine Conservancy, along with 25 municipal partners along the Brandywine Creek who work together to protect scenic, historic and natural resources. They even have a smartphone app to connect you with the over 100 publicly-accessible parks and preserves within the greenway. The Brandywine Conservancy also runs the Brandywine River Museum, featuring Wyeth and American art, and offers tours of Andrew Wyeth’s studio, NC Wyeth House and Studio, and Kuerner Farm, a major source of inspiration for Andrew Wyeth. 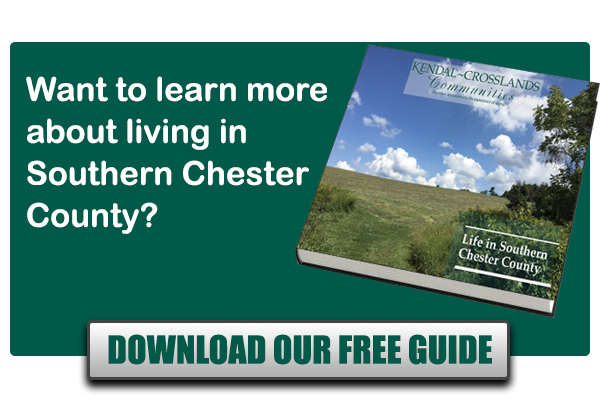 The Land Conservancy for Southern Chester County has a number of preserves throughout Chester County with great walking and hiking trails open to the public free of charge. They also host many educational programs for all ages, from bird watching events to sky tours. Nearby, Barkingfield Park in Kennett Township offers a very popular dog park and walking trails. Anson B. Nixon Park located in both Kennett Square Borough and Kennett Township features walking and running trails, a fishable pond (home of the annual Trout Rodeo each Spring), tennis courts, basketball courts, playgrounds, soccer fields and an ultimate Frisbee course, open year round, dawn to dusk, Don’t miss their many festivals and summer concert series! The Kendal-Crosslands Campus is actually adjacent to parts of Longwood Gardens, one of the world’s great gardens. Pierre duPont laid out the first garden in 1906, and over time, this country home grew to feature a world class conservatory, European water gardens, meadows, forests and more. Longwood Gardens opened to the public in 1956, and its famous displays attract visitors from all over the world, especially during the holidays. Its education programs offer lifelong learning opportunities ranging from horticulture and landscape design, to pest management, plant disease identification, to photography and art courses as well. Henry Francis duPont founded nearby Winterthur, the premier museum of American decorative arts with a 60 acre garden, and a research library serving scholars from around the world. They also have many educational programs, including two programs with the University of Delaware to train museum curators. Hagley is the original home of the E.I. duPont gunpowder works, founded in 1802 and marks the beginning of the great impact the duPont family has had on Delaware and the entire Brandywine Valley. Hagley features restored mills, a worker’s community, and the ancestral home and gardens of the duPont family. One of the true gems of Hagley is its Library and Center for the History of Business, Technology and Society, and it became an affiliate of the Smithsonian Institution in 2014. Within an hour’s drive, you can get to a whole slew of beaches in Delaware or the Jersey Shore. Well known for their boardwalks, Rehoboth, Dewey Beach in Delaware and Ocean City, Maryland are perfect for enjoying sun and surf accompanied by salt water taffy, fudge and great shops, offering fun for the whole family. You can even take a ferry from Cape Henlopen, Delaware to Cape May, New Jersey if you like! The Poconos are also within an hour and a half drive, giving you access to skiing, winter sports and water parks in the summer. Whether you are looking for a quick bite, or the best of fine dining, you can find it all nearby without heading into Philadelphia. 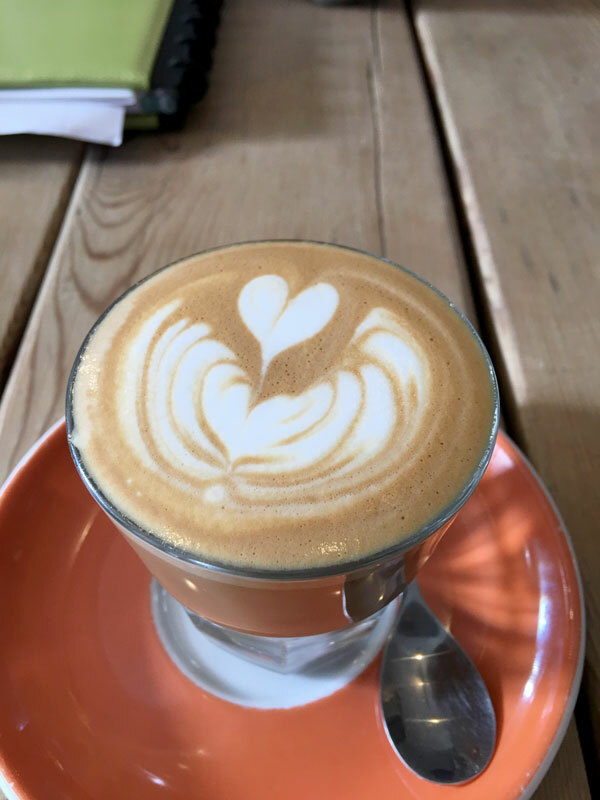 Philter Coffee is a great local coffee shop, featuring handcrafted coffees of all sorts and light menu items. Philter is so popular, it’s become the place to meet in Kennett Square and you’ll often find everyone from neighbors to local officials to the Mayor grabbing coffee and catching up at Philter. Sovana Bistro, just a few miles down Rt. 926 from Crosslands, features an amazing seasonal menu that’s always creative and delicious. It has everything from creative small plates like creamy Anson Mills Polenta with roasted foraged mushrooms, black garlic vinaigrette, crisp shiitakes and shaved goat cheese to fresh pasta, pizza and dinners featuring the freshest seasonal ingredients. Reservations recommended. Portobello’s in Kennett Square in an new American cuisine BYOB restaurant that takes advantage of being in the heart of the Mushroom Capital of the World . It features many dishes featuring locally grown mushrooms with seasonal menus, but don’t miss the Portabello’s fries made from portabella mushrooms, or the exotic mushroom crepe- they are fantastic! Hank’s Place is a diner-style restaurant that sits on Route 1 in Chadds Ford, across the street from the Brandywine River Museum, and was a favorite with Andrew Wyeth, and many Wyeth prints and paintings sit on the wall. It’s well known for its breakfast menu and frittatas, but also serves lunch and dinner. It gets crowded on the weekends, so make sure you go early! The Market at Liberty Place in Historic Kennett Square features a variety of small restaurants set up food court style, making it a great place to grab a bite with friends while exploring downtown. Talula’s Table in Historic Kennett Square has a modern-day general store feel during the day, with prepared foods, coffee, pastry and more available, where you can have a seat at a bar, enjoying a lunch overlooking State Street, or at the communal farm table, or they will pack a meal for wherever you might be headed! Talula’s is famous for its evening eight course tasting menu farm table dinner for groups of eight to twelve, with reservations needing to be made a year in advance.- It’s been called the toughest reservation to get in the US. Two Stones Pub – incredibly large craft beer selection and pub food. Hearth Kitchen– wood-fired pizza, fresh handmade pastas, creative and seasonal entrees and an eclectic selection of small plates by Chef Bryan Sikora, James Beard nominated chef who also runs La Fia and Cocina Lolo in Wilmington DE. Shopping in the area ranges from wonderful boutiques in Kennett Square, nearby West Chester, Centreville and Greenville, Delaware to major retailers along Rt. 1 and Rt. 202, including a Wegman’s grocery store. Many people take advantage of the variety of tax-free shopping in nearby Delaware at the Concord and Christiana Malls. The largest shopping mall in the US, The King of Prussia Mall, is about a 30 minute drive from campus, featuring many high-end designer retailers and impressive dining options. If you are a serious shopper looking for bargains, there are a plethora of outlets in nearby Lancaster PA, a 45 minute drive that will also take you through the heart of Amish Country, making it a perfect day out for everyone. The Philadelphia Premium Outlets are located north of King of Prussia and feature a wide selection of designer stores as well. 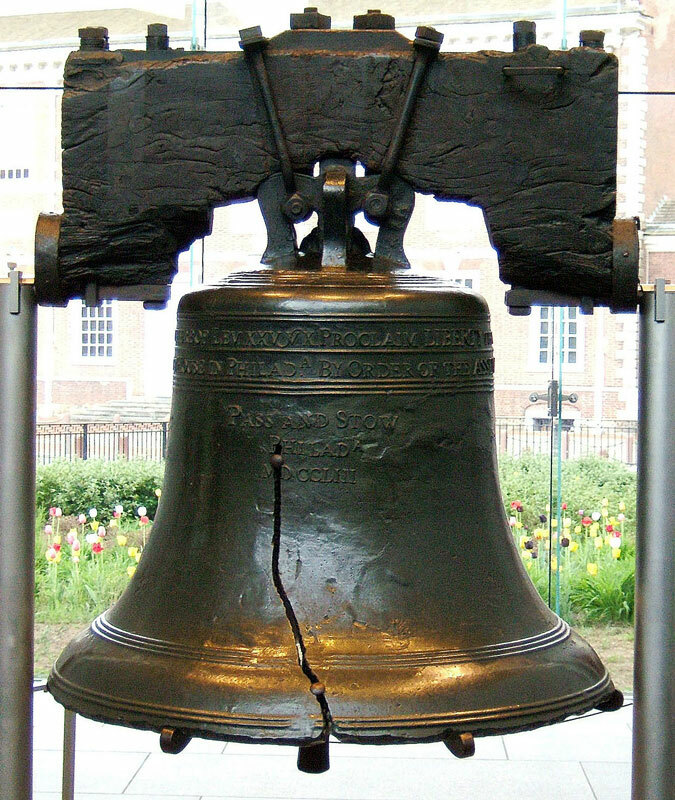 If you can’t seem to find an option that suits, remember it’s only a quick drive or train ride to Center City Philadelphia or take the Amtrak to New York City for the day, and explore everything they have to offer, and you can be home by bedtime! One of the highlights of the area is the local produce and farmers markets. Farm-to-table restaurants are commonplace in the area, because they can get the best produce from local farmers. Click here to get a more complete listing of Brandywine Valley Farmer’s markets- we’ve highlighted a few favorites below. HG Haskell and SIW Farm is a community supported agriculture farm, taking seasonal memberships as well as selling fresh produce to nonmembers from May through the end of October each year. HG’s corn, heirloom tomatoes and fresh lima beans are simply the best! The Booth’s Corner Farmer’s Market is a more traditional Amish farmers market featuring a number of stalls with produce, baked goods, Amish furniture and more, located in nearby Garnet valley. Historic Kennett Square also has a seasonal farmers market on State Street every Friday from 3 to 5 p.m., early Spring into Late Fall. It’s a great place to pick up fresh produce, local honey, cut flowers, baked goods and more from local farmers and vendors. Centreville DE also has a pop-up farmers market every Saturday in season from 9 a.m. to 1 p.m.
On top of the fantastic Brandywine Museum featuring Wyeth and other American painters located just down the street from campus, Art and Entertainment venues abound in the area. The Kennett Flash, The Grand Opera House in Wilmington DE actually is comprised of several theaters, the Grand, The Baby Grand and Copeland Hall. The offerings range from concerts, to comedians, to plays to speaker series, all within a 15 minute drive from Campus. If you have a taste for the more modern and eclectic, The Queen in Wilmington has a variety of concerts available, a film series, and local artist nights. In nearby Philadelphia, residents regularly attend performances at the Philadelphia Orchestra, Broadway shows and concerts at the Kimmel Center or outdoor concerts at the Mann Center. Museums also abound, including the famous Philadelphia Art Museum, the Rodin Museum, The Philadelphia Academy of Fine Arts, and the impressionist masterworks at The Barnes Foundation. There’s the University of Pennsylvania Museum of Archaeology and Anthropology, and for those with a more scientific bent, The Franklin Institute, The Academy of Natural Sciences and the Mutter Museum are also located nearby. While we regularly have evening programs on campus from a variety of fascinating speakers, our location makes sure that you have access to an array of cultural opportunities at every corner, and residents regularly plan group outings to many of these local events. If you like sporting events, you’ll be happy as well. 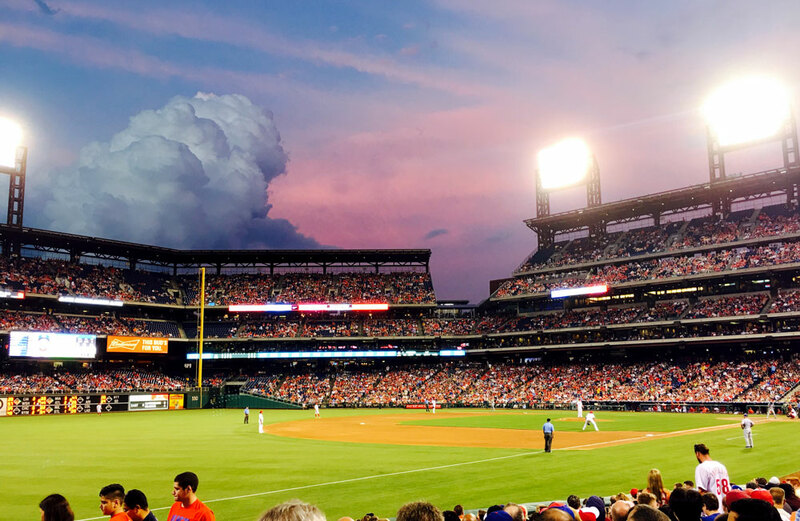 Professional sports are plentiful in Philadelphia with the latest Super Bowl Champion Eagles, The Philadelphia Phillies, the Flyers and the 76’ers. You can take in a ballgame with the local Wilmington Blue Rocks and enjoy fireworks afterward. And the beautiful Camden Yards ballpark in Baltimore is about an hour’s drive away, letting you enjoy a great day in Baltimore’s Inner Harbor and take in a game. From parks and recreation, to cultural opportunities, to being truly in the center of everything, our location in scenic Southern Chester County offers you the peace and beauty of a rural setting with access to all the excitement and opportunities available nearby. Kendal-Crosslands offers it all! You know we’re located in one of the most beautiful and convenient parts of the Country. Take the next step and learn more about what it means to become a part of Kendal Crosslands Communities by filling out the form, and we’ll send you an email allowing you to choose the information and next step in your journey!